I was looking for something a little different than what you can find in an everyday home improvement store. This two drawer vanity with a marble top and backsplash was perfect for my remodeled bathroom. Good quality, and I love the shelf underneath for extra storage. Add simple, elegant style to your bathroom with this Caroline Estate oak bathroom vanity set. 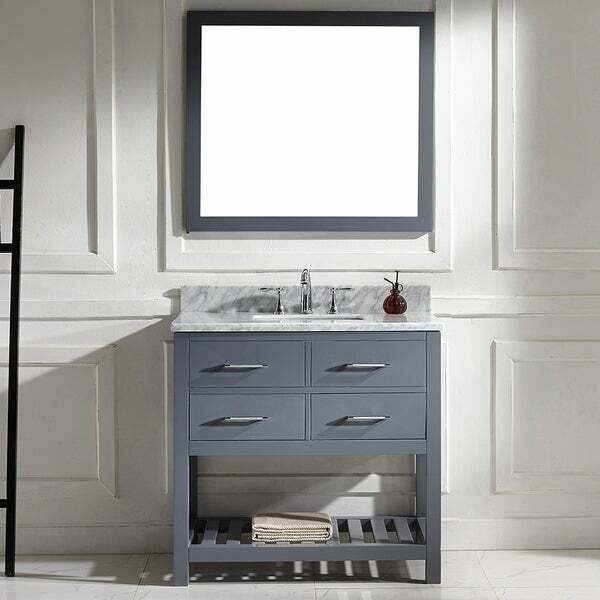 Featuring a vanity with two soft-closing drawers to hold smaller items, a bottom shelf for storing towels or linens and a carrara marble top and backsplash, this oak bathroom vanity set includes a matching full-size mirror for a coordinated look. This is a luxury vanity you just can't find at any of the stores. Delivery was not an issue, it arrived in perfect condition with proper protection and the price was very good. Love how it looks! "Where do I get the sink for this vanity?" Hello Almost retired, this vanity includes a sink. Thank you for shopping with us! Looks like the right color and is the right size. I like the style. The sink and counter top work for my dÃ©cor; I am looking forward to receiving this. I hope it's everything I'm expecting. "does this item come with an under mount sink?" Hello michellepinales, unfortunately this item is out of stock. We currently do not have inventory to check, and cannot guarantee the item will be restocked. Thank you for shopping with us.